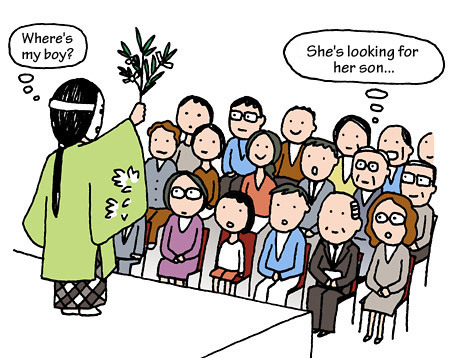 TRIVIA of Noh : Q78 : Is there a play in which the audience takes a part? | Home | Trivia | Q78 : Is there a play in which the audience takes a part? Is there a play in which the audience takes a part? For most Noh plays, spectators watch the actions of the characters from the auditorium as if they were in another world. It is rare for the actors to consider those watching as participating in the play, but in the piece "Hyakuman" the audience is an important stage element. Hyakuman, the title role, is a master of kusemai (a Japanese medieval dance). She has become mentally unbalanced after being separated from her son. Hyakuman appears before a large crowd of people assembled at Saga Seiryō-ji Temple for a large-scale Buddhist prayer event. Saying the prayer by the man in front of the temple is no good, she chants her own prayer. Before long, while dancing to tell the story of her separation from her son, she becomes frantic and runs around the crowd to try and find her missing boy. The audience in the theatre become the people at the temple watching her desperate frenzy. It is said that thousands of people were at the temple for the prayer event. Imagine a large crowd of people filling the entire surrounding area, and you will feel a world of Noh that extends beyond the stage.